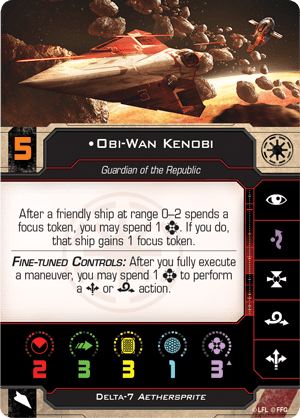 We finally get a sneak peek at the upcoming release of Guardians of the Republic! 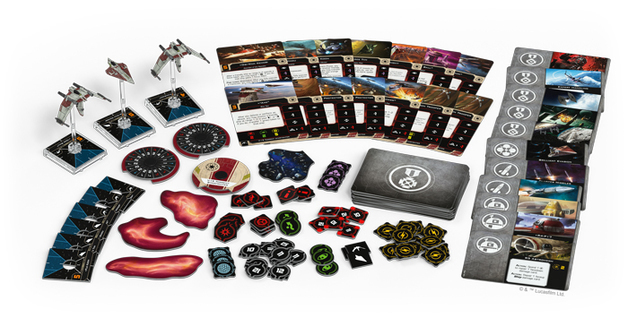 This would of course be the long-awaited Jedi themed expansion for X-Wing Second Edition. People have been wanting to fly as the Jedi from the Clone Wars Era since the inception of the very first edition of X-Wing. Soon we will all be able to jump into the Jedi Starfighters. After the hype surrounding the separatists they have a lot to match up to. 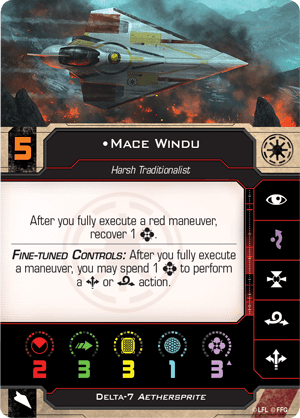 I take a look at the spoiler article and have a wee ponder on what impact these additions will have on the game we know and love. There is no hiding from this, the force is strong in the Guardians of the Republic expansion! The Delta-7 was the Jedi Star Fighter of choice. A nimble light frame chassis, these pilots rely on both their skill as a pilot and the Force to help them win the day. These guys and gals are pretty much going to be the Formula 1 drivers of X-Wing. All the named pilots in the Delta-7 are initiative 4 to 5 and they also have up to 3 force charges. This makes them fantastic aces that are able to manipulate their surroundings using the Force. 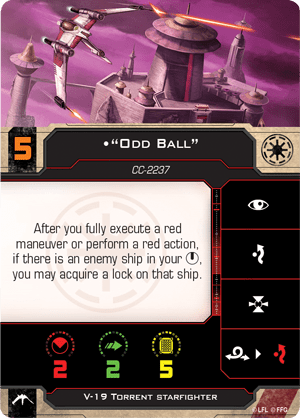 Whether it is using a Force Token to activate their pilot ability, or using it for the new purple evade action. They have plenty in the tank to control the battle. Let’s rewind quickly. What is a purple evade action? On the action bar you have the usual array of choices, however the evade action is purple. This means that this can only be used if you spend a force token. There did seem to be a bit of disappointment in this mechanic for the Jedi-hopefuls amongst the community. However, I am a fan of this. It’s fluffy and, as regular readers will know, I love fluff in my lists. That means less than half of the small ships currently available have the evade action. There are ways of adding it but it will cost you points whether it is from pilot abilities or upgrades. This means an evade token is a pretty powerful thing. 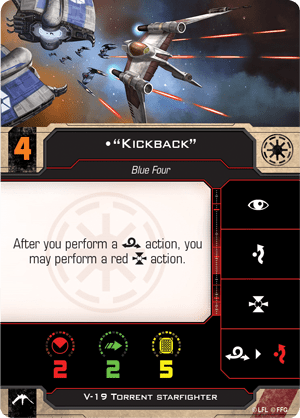 Having the player have to make the decision as to whether to use the Force Token for an evade or to keep it for dice manipulation or to use their pilot ability means they have more decisions to make and tactics to think about. A few people have commented about how it should be a freebie and that you should still get a “normal action” as well. I strongly disagree. This will make these ships quite overpowered if that were the case. Modifying dice, token stacking and repositioning all in one turn is a bit much and I think the balance this brings to the Delta-7 is just right. It is the same type of decision you are making if you are thinking of making a red action since affects your next move. Just for the Jedi and their zen-like mind, they don’t get stressed doing it. Every Jedi has the support of Clone Troopers (for a little while at least *cough* order 66 *cough*). When they head off into battle this support comes in abundance in this expansion. As well as the one Delta-7 in Guardians of the Republic you get two V-19 Torrent Starfighters. While the Delta’s are more suited for the ace in the pack the V-19 pilots are there to support your whole squad with some fantastic synergy. 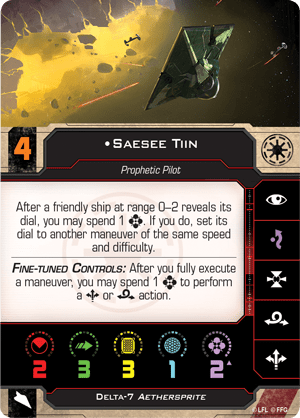 With five named pilots to choose from as well as two generics these give you some great support options for your Jedi. Alternatively, they’re solid as a squad of troopers out on their own. No shields at first glance give them a big disadvantage but that never stopped people flying Fang Fighters. In the right hands and with the right combo of upgrades this ship and pilots could be a bit of a menace. After the clear faction identity of the Separatists, the Republics is a bit less subtle. It is there, however. The big draw for this faction is the Jedi. Until the points have been revealed we cannot speculate too much on what you can fit into your 200 points. 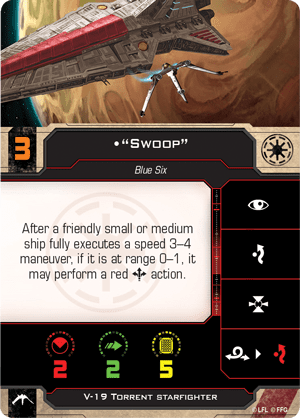 I think though that FFG are hoping for people to be building maybe 1 Jedi and 3 support ships or 2 Jedi and 2 Support ships, or a triple Jedi list. I mentioned at the top of the article that the Jedi were the F1 drivers of the game. This makes the Republic a faction for the purists. Players who would like to bring the game back to it’s dog fighting roots will snap up this faction in a heartbeat. Weaving in and out of debris, dancing in and out of each others firing arcs, and real games of cat and mouse. I like the play style that they encourage and I think they are going to be a very fun addition to the game. For me personally though they are being trumped by the separatists as my faction of choice from the prequel trilogy. That being said I am very much looking forward to seeing them on the table. Even if it is on the opposite side to me. What do you think? Are you going to be siding with the Jedi? Or like me have you been swayed by the Separatists? Let me know in the comments, and don’t forget to check us out on all the usual social media channels like Facebook and Twitter!